THE BEACH waikiki boutique hostel by IH i Honolulu, USA : Boka nu! Best place ive stayed at! Close to beach the rooms are Good Hostel style rooms! Amazing activtys offerd! Lovley common area! The straff rocks! And the manager yoshi do more for us guest then i ever seen! A True legend! Probably the best hostel I've been too in the whole world. The staff is very welcoming and helpful, the other people staying there is a great mix of ppl who wanna enjoy their stay during both day and night. The hostel organizes tours every day to some nice spots around Oahu where u meet a lot of ppl. 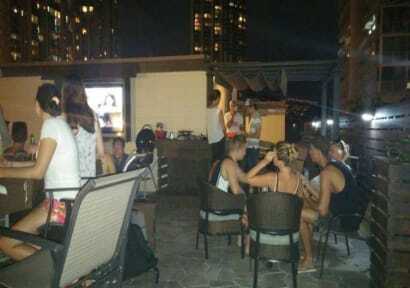 A rooftop where many ppl hang out every evening and some then continue the party elsewhere. Many solo travellers and way better opportunities to meet new people than the other hostels in Waikiki. Best hostel ever! Had a really nice stay here and met so much nice people and the staff were so helpful and friendly. The tours are absolutely worth going! 👌🏽 great location and free WiFi and breakfast, can’t get any better! This hostel is really good and the location is perfect! We ended up actually extending our stay because of all the cheap daytrips and tours they offer! Would really recomend if you're going to Waikiki. Great place! Love this hostel! Great hostel. Great place for backpackers. My friend and I enjoyed our stay here, great staffs! Friendly atmosphere and the free tours were amazing, and the driver/tour guide was insanely adventurous, great lad and had a lot of corny jokes! Though we only did one tour with him for $10, it was worth it. All the staffs were friendly and laidback, love it! Would totally recommend! I would have had a so much better experience if there had been blankets for the beds and the beds were also really hard. But otherwise nice roof deck even though it’s sucked that they closed it at 10pm and really good with all the day trips they offered for a small cost. i was very happy with my stay there, would stay again.